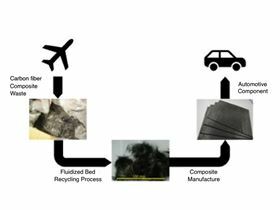 Overview of recycling of CFRP waste from aircrafts and reuse of recycled CF in automotive applications. Reducing the weight of vehicles lowers fuel consumption and the emissions of greenhouse gases and other pollutants. Steel, aluminum, and carbon fiber (CF) are all used to make lightweight vehicle components, but CF is relatively expensive. Recycled CF could be the key to future success according to researchers from the University of Nottingham [Meng et al., Composites A 109 (2018) 207, https://doi.org/10.1016/j.compositesa.2018.03.011]. “Carbon fiber recycling achieves reductions in environmental impacts compared with virgin CF production, but there is limited understanding of the financial viability of potential recycling technologies and utilization of recycled CF,” says Fanran Meng, first author of the study. At the moment, most CF for recycling comes from the aerospace sector, where some 6000-8000 aircraft are due to come to the end of their lives by 2030. Landfill and incineration of carbon fiber reinforced plastic (CFRP) from disused aircraft incurs costs with little benefit, so recycling could be an attractive option. Recycling requires two stages: first the fibers have to be recovered from CFRP, either by mechanically grinding up the material or thermally decomposing it using pyrolysis or fluidized bed process. These approaches remove the plastic part of the composite, leaving behind the CF, which can then be converted into tangled fiber mats using wet papermaking techniques or reorganized into aligned fibers. “We assessed the cost impacts of using recycled CF as a substitute for conventional materials over the full life cycle of products, providing an insight for decision-makers considering reductions in weight, energy intensity, greenhouse gas emissions, and life cycle costs,” explains Meng. The costs of newly manufactured – ‘virgin’ – CF vary depending on its properties from $55/kg for standard civil engineering materials to $1980/kg for high-end, high-spec CF for aerospace applications. But the researchers calculate that CF can be recovered from CFRP waste using a fluidized bed process for just $5/kg and less than 10% of the energy required to make virgin CF. “Maintaining the mechanical properties of CF through the recycling processes is a key challenge in developing a commercial CF recovery process and trade-offs clearly exist between the competing recycling technologies,” admits Meng. The fluidized bed process, however, produces CF with almost no reduction in modulus and an 18%-50% reduction in tensile strength relative to virgin CF making it suitable for applications requiring high stiffness rather than strength. “Recycled CF may be applicable for non-structural applications where lightweighting is required such as automotive, construction, wind energy, and sports industries,” suggests Meng. If large quantities of recycled CF become available to these industries in future, there could be significant benefits in weight reduction, energy and costs savings, and greenhouse gas emission cuts. ELG Carbon Fibre, which specializes in recycled carbon fiber materials, has received ISO 14001:2015 environment management system accreditation. ELG Carbon Fibre is taking part in a project to develop a novel composite bogie frame for use in rail vehicles. ELG Carbon Fibre has started production of a range of nonwoven mats on a new line specifically designed to process recycled carbon fibers. Materials Today Interview with Dr Davide Crivelli from the Politecnico di Milano about acoustic emission. Researchers from Washington State University have developed a new method to recycle the carbon fiber plastics. Reinforced Plastics investigates the tricky, and increasingly topical, problem of recycling carbon fibre reinforced composites. The use of carbon fibre composites in automotive applications is increasing as vehicle lightweighting becomes increasingly important.